Ecollar Essentials is designed to empower participants to make informed decisions about how to effectively and humanely apply ecollars in their training based on a working understanding of the potential benefits, contingencies and contraindications of the tool. Delivered in a very hands on format, Ecollar Essentials provides participants the opportunity to take what they have just learned in theory and apply it in practice. By examining what works (and what doesn’t) participants are guided to adjust their approach for greater effect by applying that new understanding in practice once again. Theory components will be provided as a foundation to the practical work. The practical aspect of this course involves you applying the course content to your own dog, or a dog that you have a well established working relationship with with. The number of the dogs taking part in the program will be limited to ensure that there is plenty of opportunity for everyone to actively participate and recieve sufficient feedback and tuition. We have designed a very simple application process to help us make sure that you are going to find the course well suited to your needs and be in a position to benefit from the curriculum. NDTF graduates, current NDTF students and sufficiently skilled dog training enthusiasts are invited to apply. You can download a copy using the large yellow button below. Participants will be invited to an online meeting prior to the day that will orientate them to the Program. There will be some mandatory pre-event material for Learners to absorb, which will be delivered in an online format and will involve some practical exercises. A wide variety of dog personality types are welcome. There is a section on the Application Form that will ask you a few questions about your dog’s personality, as this is not a course that is specifically designed to deal with dogs that have pronounced behavioural or emotional issues. Great quality food and real coffee will be provided to you – no fast food, no instant coffee. Morning tea, lunch and afternoon tea as well as access to tea and coffee for the duration of the course. For those with specific requirements including allergies there will be specific arrangements made as needed. This program is running on 2-3 May 2015. Price of participation is $540. A number of payment options exist, including a payment plan via Paypal which you can see at the bottom of this post. All work during this course will be conducted on Educator brand ecollars. If you do not own one we will have a number of loan units available on the day. 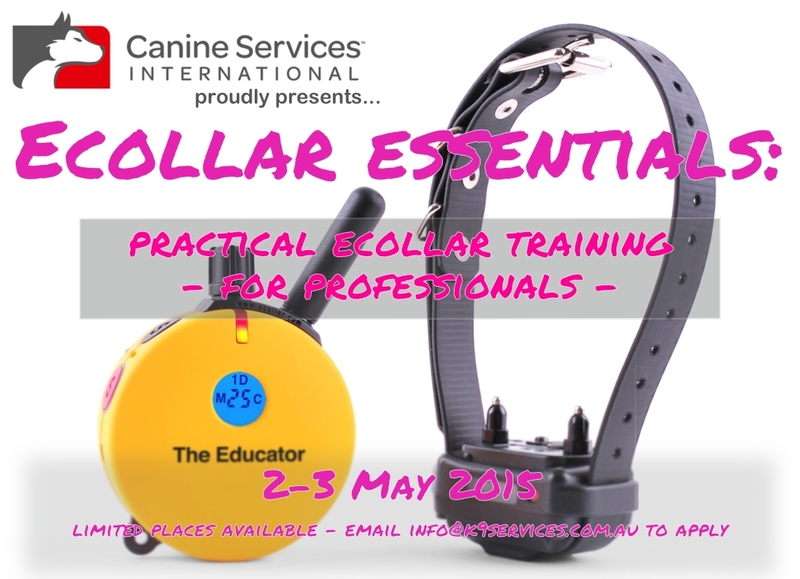 Participants have a limited time opportunity to purchase an Educator 300TS ecollar package (including a dummy collar) at a heavily subsidised rate of $225 (saving of almost 50% or $220). A limited number of partial and full scholarship positions are on offer for all courses and will be awarded at the discretion of CSI. All applicants should offer a letter of application and attach any relevant information to support their application. All dogs will be required to pass an ecollar suitability examination that will form the basis of compliance with relevant Victorian legislation. For those that have not had a veterinarian perform such a check, CSI intend on providing a veterinarian to perform such a check on the day. At your request we are most happy to invoice you directly. This means your cost is reduced by around 3% as you avoid admin fees associated with PayPal – just email us on info@k9services.com.au and we will get you booked in. At this time (17.4.2015) options for instalment payments have now closed and are no longer available. A variety of payment options are available, so please contact us for more details.